You were here. What did you like? Tell us your Library story! Tell us why the Library is important to you or your family. We’ll share stories on our website and in publications to show how the Library is making a difference in West Bloomfield. 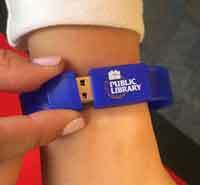 Receive a special West Bloomfield Library wristband flash drive as our thanks to you for sharing your Library story with us!